Always remember that no drink can help you melt belly fat if you do not exercise! Certain flavored drinks can help you get a nicer body line without eating many calories, and these also aid in the digestion process. Make them at home and make sure you use all-natural and organic ingredients that are not loaded with sugars and other additives. Water is your best friend when it comes to your health, regardless of whether you follow a strict diet regimen or not. It stimulates food digestion and absorption and helps in the elimination of waste material from your kidneys and intestines. It will also keep you sated for longer. 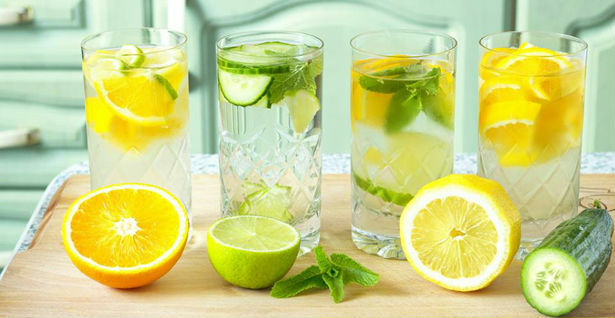 If you do not like plain water, “enrich” it by adding some lemon juice. This combination has the same composition as gastric acid. You can also add some grated ginger -- it will boost your metabolism. Fresh cucumber slices can also do the job and you will sure enjoy the recommended daily amount of water with no problem. Mint helps the stomach absorb grease and it also soothes the digestive tract. Mint has strong diuretic effect, it boosts the metabolism and decreases appetite. Moreover, it also helps you maintain your oral hygiene, because of its aromatic oils that freshen breath. This is why almost all natural toothpastes contain mint. Pineapple contain bromelain, an enzyme that aids in the digestion of protein. It will stimulate digestion and eliminate bloating. You can always add some flaxseed oil and increase its power. Most of the polyphenols in green tea are catechins, which are great when it comes to melting fat. Drink green tea before your workout. Focus more on aerobic exercises, as these boost the fat melting process. If you need a reason more to replace at least one cup of coffee with green tea, check this one. Green tea has the ability to decrease cholesterol levels and reduce the risk of cancer. In addition to this, green tea is also great for diabetics and individuals who struggle with stress every day. Drink more green tea to protect your teeth from viral infections.